IMP C P LIC GALLIENVS AVG, Radiate cuirassed bust right | VIRTVS AVGG, Mars standing facing, head left, holding spear right and shield left. 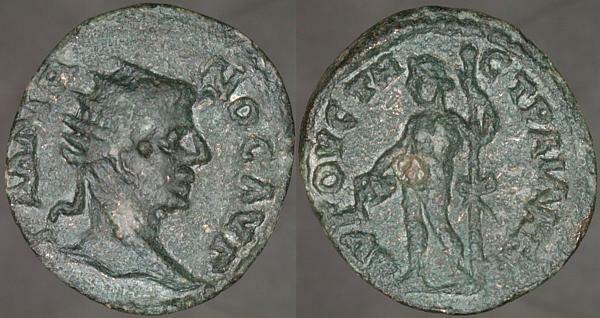 A coin issued early in the joint reign of Valerian and Gallienus, of metal of a quality that would decline further and further, the reverse features Mars, Roman god of war, equivalent to the Greek Ares, as the embodiment of valor, and the obverse the emperor in a cuirass, Roman body armor. IMP VALERIANVS P AVG, Laureate draped cuirassed bust right | P M S C_OL VIM, Moesia standing, head left, with bull right in left field and lion left in right field. AN XVI in exergue. Last week I posted a well-worn Viminacium provincial for Mariniana. Here's a better preserved coin of that city, issued for her widower, Valerian. The AN XVI in the exergue is the date, counting forward from the establishment of Viminacium as a colony in 239/240 CE, so this coin was issued in 254/255. GALLIENVS P F AVG, Radiate cuirassed bust right | GERMANICVS MAX V, Two captives seated at the foot of a trophy, their arms tied behind their backs. The Romans adopted the setting up of trophies from the Greeks: enemy arms were hung on a simple frame to produce a man-shaped reminder of the enemy's defeat. The reverse design here is frequently seen on Roman coins: bound captives seated at either side of a trophy; the enemy defeated and taken into slavery. This coin was issued not long before Gallienus's father Valerian was taken captive and enslaved by the Sasanian Persian king, Shapur. IMP TITVS CAES VESPASIAN AVG P M, Laureate head right | TR P VIIII IMP XIIII COS VII P P, Venus standing 3/4 rear, leaning on column, holding crested helmet right and transverse spear. Titus Flavius Vespasianus, elder son of Vespasian, was not a favorite of fortune. If not for his role in the "first Jewish war" he'd be a figure of pity. On August 24, 79 CE, exactly two months after his accession to the throne upon his father's death, Mount Vesuvius erupted, destroying /Pompeii and Herculaneum. Roman spin doctors were good, but nobody's good enough to turn that into good omens. During 80 CE a large fire did extensive damage in Rome. He died in September, 81. He may have died of a plague that was in progress, but it's always been rumored that his younger brother, Domitian, took an active role in advancing his own ambitions. ΓΑΛΛΙΗ_ΝΟC ΑVΓ, Radiate head right | ΑVΓΟVCΤΗ_C ΤΡΑΙΑΝΗC, Dionysus standing facing, head left, holding thyrsus right & and pouring from kantharos left. 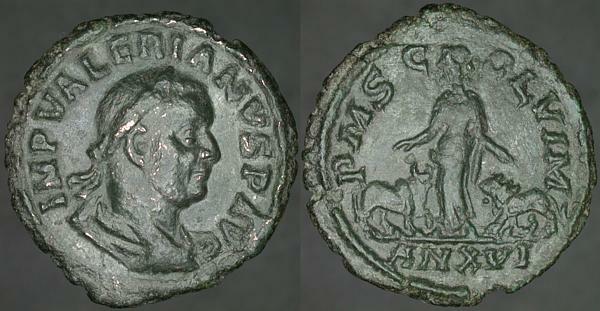 Varbanov describes two coins of Gallienus from this city with Dionysus on the reverse. Since he does so in Bulgarian, I can't tell which this is. Whatever. Dionysus, the party god, hangover included. GALLIENVS AVG, Radiate head right | FORTVNA RED, Fortuna standing facing, head left, holding cornucopia right and rudder left. II in right field. The abbreviated reverse legend, for Fortvna Redvx, either celebrates Gallienus's fortunate return, or hopes that he will so return. When the coin was issued, the people would have known which was intended, and what journey he had or would make, for what purpose. The legend, in full or abbreviated form, is used on coins from Rome, Mediolanum, Cyzikus, and Antioch, as well as this and other issues from Siscia. Gallienus got around. 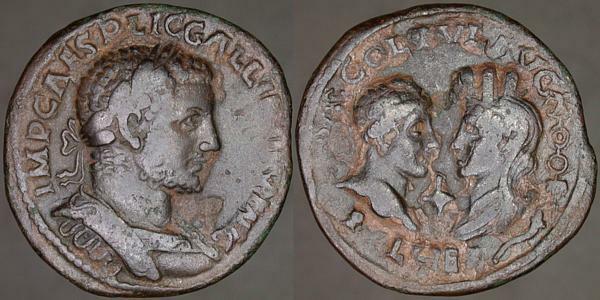 IMP CAES P LIC GALLIENVS AVG, Laureate cuirassed bust right | COL IVL AVG / FEL HEL, Confronted busts of Mercury left, cauduceus behind, and Tyche right, legionary standard over cornucopia behind, marsupium between. Interesting, interesting, interesting. As best as I can tell, this isn't catalogued for Gallienus, though it is known for his father, Valerian. It's no surprise that a coin known for Valerian should also exist for Gallienus, but coins of Heliopolis aren't especially rare, and it is surprising that it's not in the common catalogues. Nice portrait of the emperor, too.